As a registered charity EDCCA works hard to support people in need and improve their quality of life in Easingwold and District. 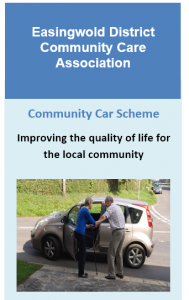 We know that there are many people who because of their age or for health reasons rely on the services that we provide such as using the community car scheme to attend a medical appointment or being visited by a friendly volunteer through our Befriending scheme. We have much to be proud of and I would like to thank you for your continued support. 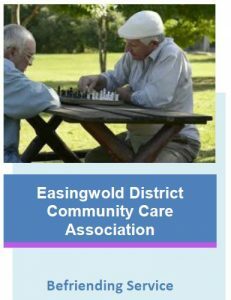 Easingwold District Community Care Association needs your help! Join easyfundraising and you can collect free donations for us every time you shop online. It won’t cost you a penny extra. 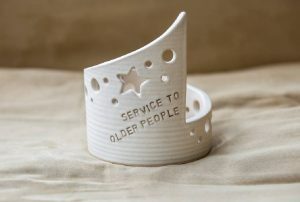 Show your support here http://www.easyfundraising.org.uk/causes/easingwooddistrictcommcare and help make a real difference. We raise funds to support all our services to help people in the community. Please visit our justgiving page at: https://www.justgiving.com/edcca to see how you can help. Here at Easingwold District Community Care Association we take our internet security very seriously. Which is why we have partnered with ESET, an award winning global security company, to protect our charity from cyber-crime and threats to the security of information. 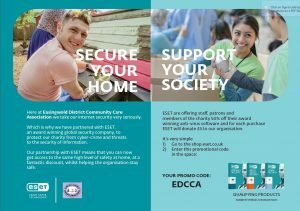 Our partnership with ESET means that you can now get access to the same high level of safety at home, at a fantastic discount, whilst helping the organisation stay safe. 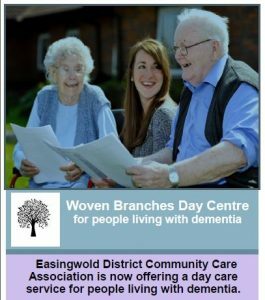 Easingwold District Community Care Association is offering a day care service for those people living with dementia. Join us in a safe, home from home environment in Easingwold to make new friends and join in activities. You will be able to talk to dementia support staff and be helped to enjoy your day by trained volunteers. The cost for the day is £35. This price includes a hot two course lunch and refreshments throughout the day. 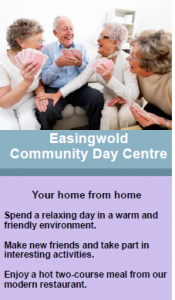 Easingwold District Community Care Association runs a Community Minibus Project. The 15 seater bus has a tail lift for easy accessibility and wheelchairs and walking frames can be accommodated. To hire the Minibus your group must be a properly constituted not-for-profit organisation and have their own qualified minibus driver. EDCCA may have a qualified driver who can be available. EDCCA have received £4301 from the Co-op Community Fund. 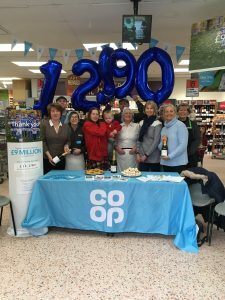 The presentation and took place at the local Easingwold Co-op on Long Street on April 19th. Thanks to all who supported EDCCA and to the Co-op. 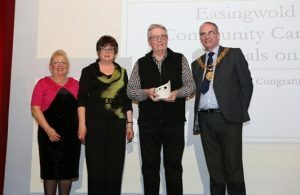 Easingwold District Community Care Association’s (EDCCA), Meals on Wheels Scheme wins Hambleton District Council’s Community Award for Services to Older People. Pictured here are Cllr. Bridget Fortune, Helen Lambert, EDCCA Volunteer Coordinator, Geoff Lambert, EDCCA Volunteer and John Noone, Chair of Hambleton District Council. 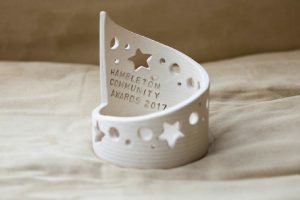 On 24 March 2017 a glittering event was held at The Forum in Northallerton for the Hambleton District Council’s Community Award Ceremony to recognise those who work in our communities across the Hambleton district. Easingwold District Community Care Association’s Meals on Wheels Scheme was nominated and won the category “Services for Older People”. Helen and Geoff Lambert accepted the award on behalf of Helen Beck, Meals on Wheels Coordinator for EDCCA, and her team of volunteers who deliver the meals. 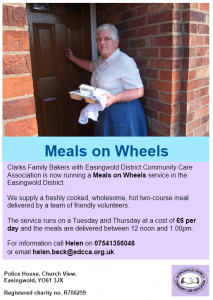 Clarks Bakers on Long Street, Easingwold prepare the hot, nutritious meals which are then delivered by volunteers to members of the community twice a week. The service provides a hot, two course lunch on Tuesdays and Thursdays every week which not only helps maintain good nutrition but also provides some welcome social contact. Helen Lambert, on behalf of EDCCA said “It is heart-warming to know that there are so many generous people who give their time freely to improve the well-being of others”. 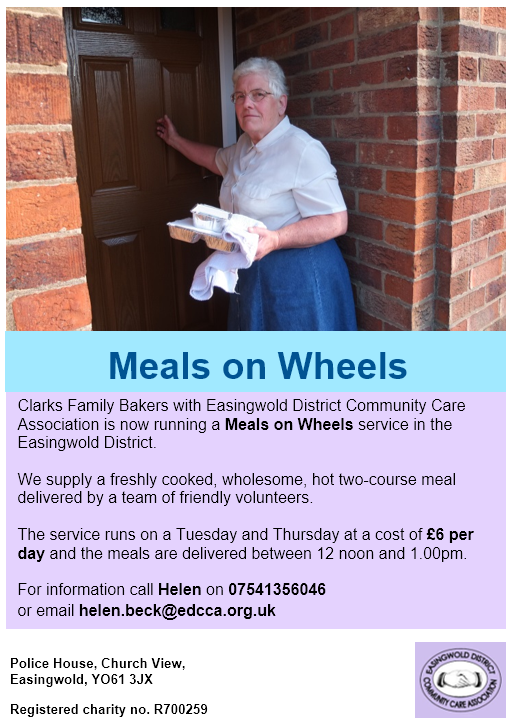 If you would like to find out more about the meals on Wheels Scheme or other services run by EDCCA then please contact our office on 01347 822875 or email info@edcca.org.uk.